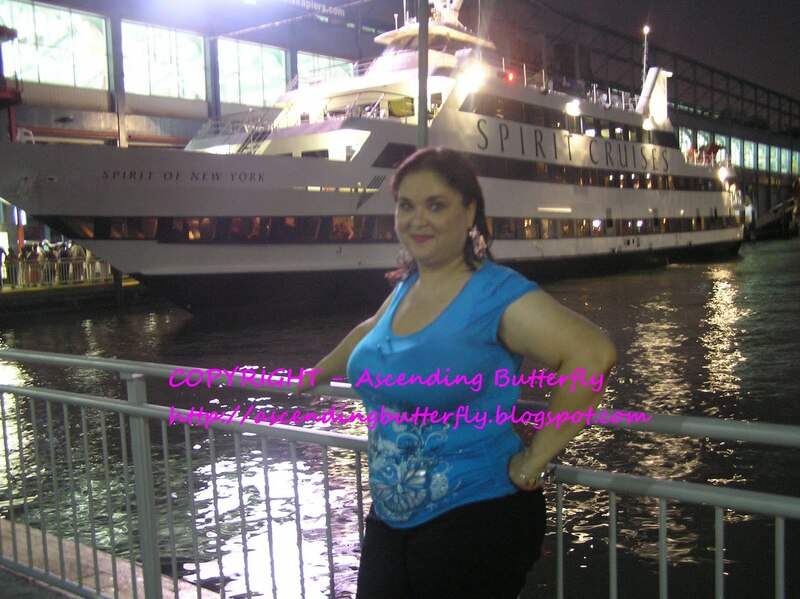 Ascending Butterfly: The Night was Hot, The Jazz was Cool! I have been falling in love with New York City all over again this summer! I've lived here my whole life and it took this summer for me to realize I had been taking my beloved City for granted. After attending BlogHer last week and watching other people's fascination with "The City That Never Sleeps", it reminded me of just how much there is to actually see and do here. I've had an incredibly busy summer. More so in fact than I ever remember, but the highlight of my summer was this past Wednesday when I set sail on a Spirit Cruises Yacht around the Hudson River thanks to our friends at SmoothJazzNY. In June we hosted a giveaway with Smooth Jazz and you can see our original post HERE. 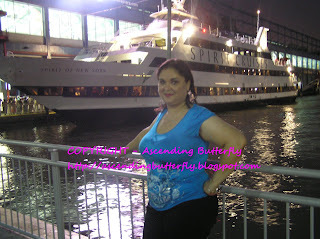 Oddly enough, I beleive both of Ascending Butterfly's winners set sail before we did! You can see the coverage on Single Mama NYC of her sailing HERE. She got some great shots! 'The Guitars & Saxes Smooth Cruise' was an amazing (sold out) concert (and I could see why!) that included: Peter White, Kirk Whalum, Jeff Golub and Gerald Albright and it was AMAZING! The concert was fantastic, and with all those musical guns firing I had no doubt it would be. Thankfully my sail companion suggested sitting outside and I am so glad we did. We sat on the upper level with a front facing table with amazing views, and were super stoked about the amazing attentiveness of the staff at Spirit, we availed ourselves of the tableside beverage service (which meant not having to get through the crowd or leave our coveted table! ), And enjoyed the amazing views, amazing sounds and time spent just enjoying the journey. I was pleasantly surprised that there were some 'inspirational' songs played, and when the Yacht was returning to the pier, I was a bit sad to see my amazing journey come to an end, but also incredibly uplifted and very grateful! This was supposed to be our 'Sunday's Moment of Gratitude' post, but I actually, get ready to gasp now, took an ENTIRE day away from all things electronic to re-connect with friends I haven't seen since High School to enjoy a girls night out and go see Eat, Pray, Love. And I had a great time! It had been way too long since I had some 'just me', 'breathe' and relaxation time and then this past week I was blessed with not just ONE but TWO girls nights out, isn't that cool? I'm definitely begining this week in a cup 'more than half full' frame of mind and it's a great place to be! We definitely look forward to working with Smooth Jazz again next summer! THANK YOU! Thanks Patty, I forgot your sail was 8/25, I can't wait to see your pictures! Have fun!